LONDON (Reuters) - Evaporating inflation and slowing growth have put financial markets into such a spin that they could inflict further damage on the world economy. Until a dramatic selloff, exuberant markets had raced well ahead of the economies that underpin them, partly because the U.S. Federal Reserve and other central banks flooded the financial system with new money. With the Fed set to turn off its money taps at the end of this month, investors appear to have woken up to poor growth prospects in much of the world, something International Monetary Fund chief Christine Lagarde has termed a "new mediocre". It's not all doom and gloom. The outlook for the world’s largest economy has not suddenly taken a turn for the worse. And a 25 percent plunge in the price of oil since June should put more money in the pockets of companies and households. "U.S. momentum has softened a little but we expect growth to remain solidly above trend. At the same time, the drop in oil prices is as much a reflection of supply as demand factors," economists at Goldman Sachs said in a note. "For consumers in the largest economies, it should provide meaningful relief, offsetting the pressure from tighter financial conditions and weaker global demand." Fears are centered on recession and even deflation in the euro zone and the extent of China's slowdown. When the world financial crisis raged from 2007-2009, China's resilience was one of the major silver linings. It may not be this time. Chinese third-quarter gross domestic product numbers due on Tuesday are forecast to show growth at its weakest pace in more than five years, at 7.2 percent year-on-year. 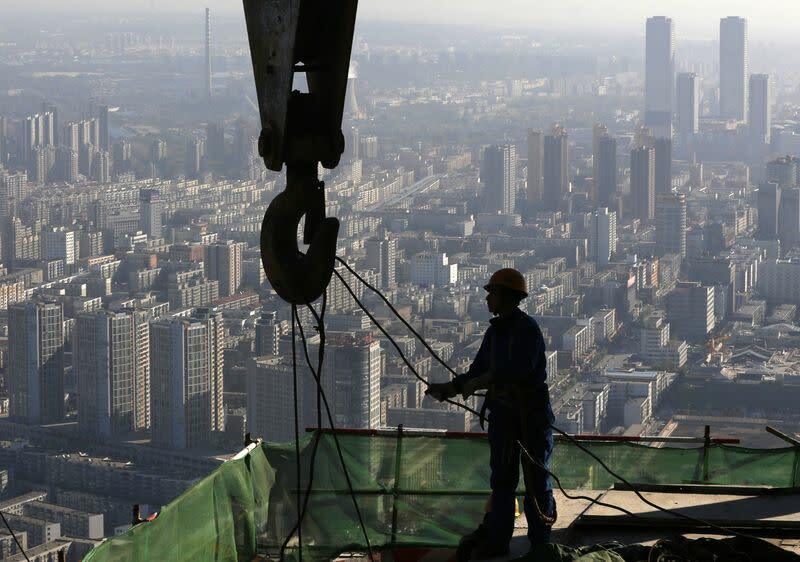 Beijing is expected to roll out a stream of stimulus measures in coming months, though most economists believe it will hold off on an interest rate cut unless conditions deteriorate sharply. A poor run of economic data suggests Germany will flirt with recession in the third quarter, having contracted by 0.2 percent in the second. Flash October purchasing managers indices for the United States, euro zone, Germany and France -- due on Thursday -- will give a first glimpse of the state of their economies heading into the last quarter of the year. Britain won't escape the impact of the euro zone's malaise but is in much healthier shape. Third-quarter GDP data on Friday are forecast to show growth of 0.7 percent in July to September. The International Monetary Fund, United States, G20 and European Central Bank have pressured Berlin to increase public spending to lift its own economy and help its peers in the currency area. But the German government, the only one in the euro zone with the resources to spend more and the heft for it to make a difference, is committed to a balanced budget with no net new borrowing in 2015. The argument will doubtless be reprised at an EU leaders summit in Brussels late next week. France and Italy are pressing for more leeway on debt targets to buy time to push through much-needed structural economic reforms but are likely to have their 2015 budgets rejected by Brussels, leading to a scramble to broker a face-saving deal. The German and French economy ministers have asked experts in Berlin and Paris to come up with reform recommendations for their countries in an apparent attempt to avert a full-blown clash over economic policy. The hope is that a renewed French and Italian commitment to economic reforms will persuade Germany to loosen its purse strings and the ECB to act more forcefully, even crossing its Rubicon and printing money. The ECB has denied there is any "grand bargain" in the offing and officials admit that whatever transpires -- the aim is that a deal will be done in time for a December summit -- may fall short of what is required. "We now see sovereign QE as unavoidable next year," said Ruben Segura-Cayuela, economist at Bank of America Merrill Lynch, referring to quantitative easing, or asset purchases with new money. "In a central scenario of a weak economic recovery, where the fiscal stance does not ease meaningfully, and an inflation profile that surprises the ECB on the downside, we believe the central bank will be forced to do more than it has done so far." The euro zone's most pressing problem is Greece, where borrowing costs have rocketed way above the level that would allow Athens to quit the bailout program hated by its people and return to financing itself on the markets. Prime Minister Antonis Samaras insists Athens will press ahead with plans to wean itself off EU and IMF aid.